The cruise ship Adonia was the first US liner, which berthed in the Cuban capital Havana in 50 years. The vessel made a voyage from Miami with 700 passengers on board and was welcomed by hundreds of local citizens, who waved flags of the United States and Cuba. The cruise ship Adonia is operated by Phantom Cruises, which is part from Carnival. This is the first company, which received permission from USA and Cuba to operate between the two countries since they resumed diplomatic relations. The cruises among them were banned after the Cuban revolution in 1959. 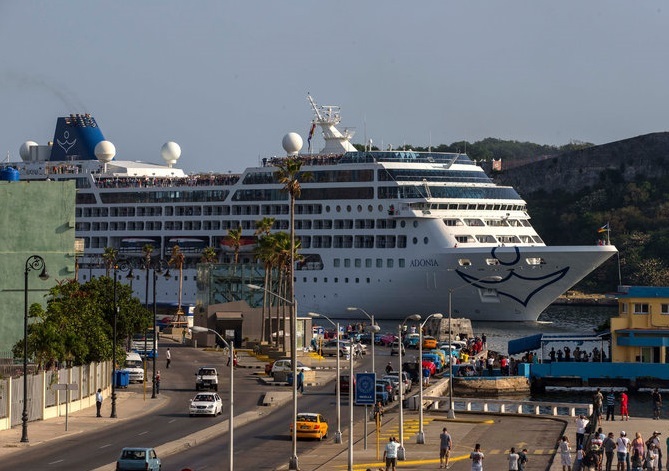 The cruise industry expects revival of voyages between USA and Cuba, which should bring millions of dollars in the Central American country and to support the delayed economy. Cuba is starving for fresh foreign currency, which should boost the economy and business. On other hand, the cruise lines are looking to provide their customers new and more attractive destinations. More than a dozen cruise lines announced plans to work on cruises between USA and Cuba, and if they actually begin to function, Cuba can earn more than 80 million USD per year. The cruise ship Adonia (IMO: 9210220) is relatively small vessel of Carnival Cruises, but made historical voyage and started new era in cruise industry. The ship has overall length of 180.45 m, moulded beam of 25.50 m and maximum draft of 5.95 m. The vessel has 9 passenger decks and maximum capacity for 777 guests. The total number of decks on board are 12 and displacement is 15,100 tons. The deadweight of cruise ship Adonia is 2,700 DWT and the gross tonnage is 30,277 GRT. The vessel was built in 2001 by Chantiers de l’Atlantique shipyard in St Nazaire, France.